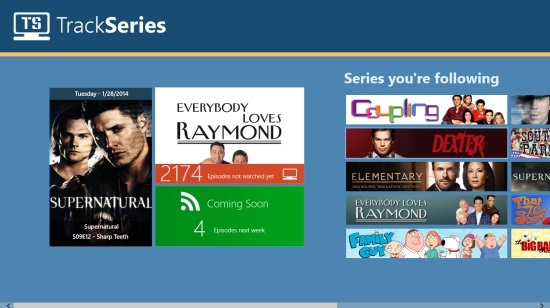 Trackseries is a Windows 8 TV Series Tracking App. It can be used to keep track of your favorite TV series that you like and follow. You can use this app to conveniently get info about the episodes from various TV Series. You can add flags to episodes you haven’t watched, and to the episodes you have watched. 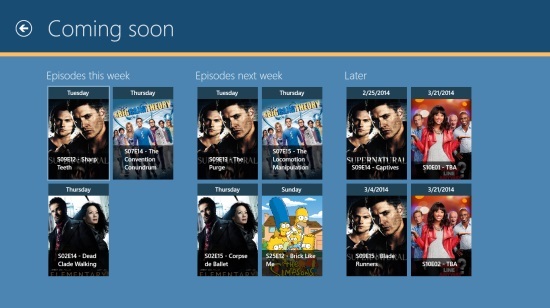 The app has an option that will show you which TV episodes are to be aired recently. 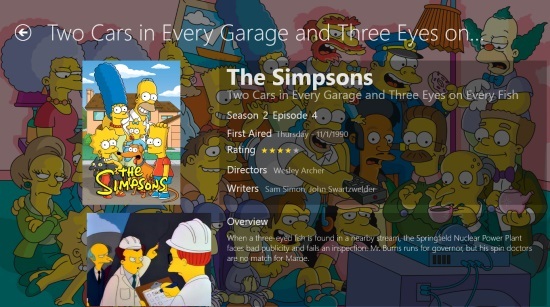 Trackseries is freely available in the Entertainment category of the Windows Store. On the main screen of the app, on the left most side, there are options available as tiles. The first thing you have to do in order to efficiently use the app, is to add any series to get info for it. In order to add the series, you have to use the option to add series. The option for it is available in the bottom flyout of the app. To get to the bottom flyout of the app, right click anywhere on the app’s interface. A panel will appear, containing the Add Series option. Give the name there, and you would be shown a number of matching results. If you open any of the matching series, it would be automatically added to your followed list. Follow series by following this procedure, and according to the series you are following, some options will appear on the landing page of the app. The left most tile would show you the episodes from the TV Series, that would be aired recently, that is, today or within a day or two. 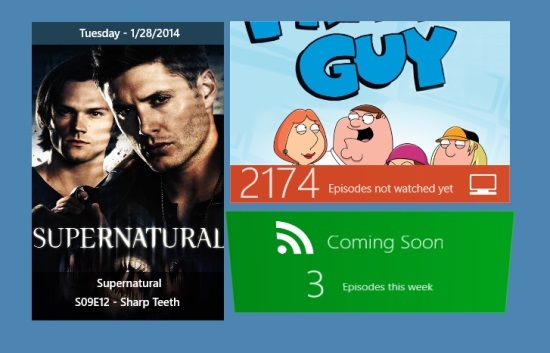 To the right of it, in the upper tile, the number of episodes you have not watched are available. Clicking on it, you would be able to get to the screen where you would be shown all the series you are following. 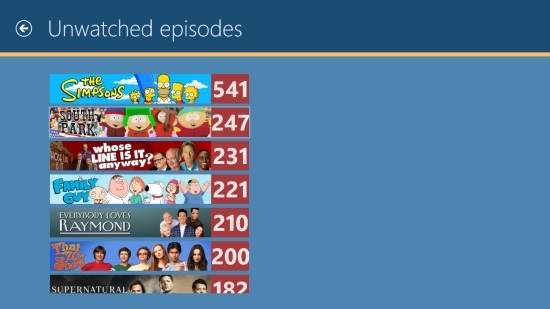 Along with the series, the number of episodes that you haven’t watched would be displayed. The option that is available below this option, will show the number of episodes that would be aired this week and the next week. On the main screen, to the right side of the option, all the series you are following would be shown. 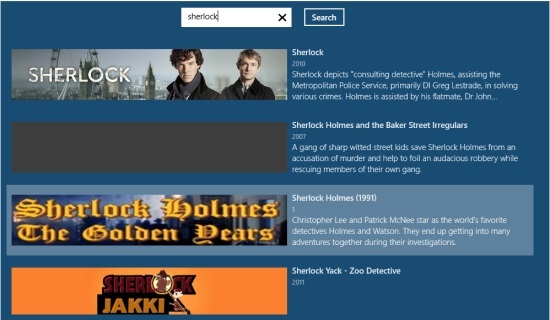 Get to any of the option that is available here, and you would be shown the description about the series, the number of episodes you haven’t watched would be shown. Get to the right side, and all the seasons along with the episodes would be displayed. The episodes would be initially flagged as Episode To Watch. You can change the flag to seen, if you right click on the episode, and choose to add it to watched list from the option for it that appears in the bottom flyout. You can choose any of the episodes to get description for it. Also check getgloo, Imdb Touch, and Movie Preview App. Get info about the series you want to follow. Get the date on which the show would be previewed. 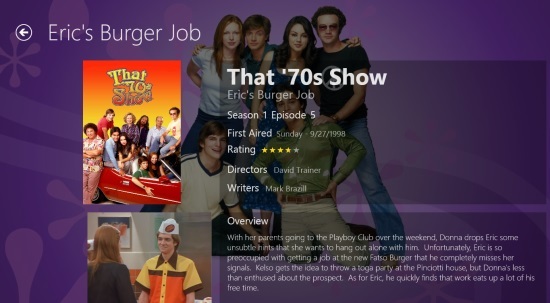 Finally, I would like to say that the app is quite nice Windows 8 TV Series Tracking app,, which you can use to keep track of various TV series that you like. Give it a try for sure.